Can a Family of Eight Travel on a Budget in Ireland? Reader Pauline Mankoff wrote the Traveler staff asking for any advice or help we could offer her for her upcoming, but yet-to-be-planned, trip to Ireland with her children and grandchildren--eight travelers in total. The family doesn't currently have a computer or Internet access, and with seven weeks and counting until the presumed departure date, Team IT came to the rescue. "We want to fly into Shannon, in mid- to late-August, for eight to ten days," she told our researchers over the phone. Mankoff herself has already visited Dublin, and would like to show the kids the "the historic sites, the genuine Irish culture," she explained. Okey dokey. A lofty assignment for this first installment of Ask IT, but we were all over it. Mankoff told us she was looking for inexpensive lodging and budget and family-friendly activities. "Nothing luxurious," she warned. So here you have it, Mrs. Mankoff. You asked for IT, you got IT. Because the family is based near New York City, flying to Ireland is a cinch. Delta offers non-stop service from JFK to Shannon, with a total flying time of less than seven hours. 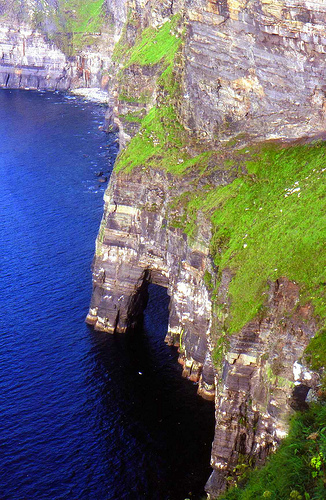 Bus Éireann's tours average around $30 per adult (or $20 for students and seniors) for a day trip and include itineraries through spectacular scenery, like the Ring of Kerry, Cliffs of Moher (pictured), Bunratty Castle, and more. Many of Ireland's most authentic sites are free or have only a nominal entrance fee, from castles and churches to prehistoric sites and hiking and biking trails. Plot your itinerary at DiscoverIreland.ie, where you can hopscotch by county through Ireland's offerings. Remembering Mrs. Mankoff's words, ("budget, budget, budget!") IT recommends the family find a vacation rental, first and foremost. And don't city-hop too much. Not only will that add transportation costs, most vacation rentals are more economical the longer you stay. Plus, in rural Ireland, eight people lugging ten days' worth of luggage would be an unnecessary pain. But in which city? We've offered up a few suggestions (Cork, Dingle, Galway), all located within three hours (by train or bus) of the Shannon airport. Choose wisely. Cached in artsy West Cork (125 miles from Shannon), solar-powered South Reen Farm is an idyllic retreat in rural western Ireland. Rent the intimate farmhouse for the relatively low price of 1,050 euros a week, and have free rein of four twin-bedded rooms, one double room, three bathrooms, a full kitchen, sunroom, and a wood-burning stove. "It is surrounded by water," wrote Catherine Mack recently in the Guardian, "with Lough Cluhir overlooking the farm, the depths of South Reen harbour at the end of the road, and the roaring waves of the Atlantic over the hill. Take a morning dip in the tiny bay, go whale-watching in the afternoon, and kayaking off the pier at midnight." The area's appeal may be rooted in rural charm, but Cork city is also considered the country's "second city." In April 2007, Traveler suggested eating your way through the city on a culinary adventure. Writer Jessica Merrill wrote, "Southern Ireland's fertile farmland, rugged coastline, and entrepreneurial folks are the prime ingredients, the reasons why Cork city has become a hotbed of sophisticated restaurants and dazzling food shops." This area of Ireland, with its rugged coastlines, idyllic sheep-speckled green hills, small-town charm and "the greatest concentration of early Christian archaeological sites" in the country, according to Traveler's Ireland guidebook, seems to fulfill all the Mankoffs' requirements. Located on picturesque Ventry Harbour and only four miles from the quirky little town of Dingle, the family-owned Ventry Beach Cottage comfortably sleeps eight; its three bedrooms are outfitted with warm Irish décor. Rates are highest in August, but the cottage rents for an entirely feasible 950 euros per week for eight people. Ventry Beach is an ideal jumping-off point for Ring of Kerry tours, featured on Traveler's website. The cottage is also a mere stone's throw away from several famed mysterious ruins that dot the countryside here. A couple miles down the road from the cottage is the Iron Age Dunbeg Fort, perched precariously on a sea cliff at the base of Mt. Eagle, with dramatic views and a budget-friendly visitors center. Or, for an entirely different Dingle Peninsula experience, say hello to Dingle's resident dolphin Fungie, who's been making regular appearances around the bay for more than 20 years. The younger Mankoffs might be interested in Dingle Boatmen's Association's one-hour dolphin spotting trips, which are free if Fungie is a no-show. In a region where "pub-going is an activity as natural as breathing," (according to Traveler's own guidebook to Ireland), the bohemian Galway city, population 72,414, is as old-fashioned as it is young and frisky, making it an ideal match for the multi-generational Mankoff clan. To get a feel for the Galway of yesteryear, pick up the Tourist Trail of Old Galway in the city's visitor information center, providing historical and architectural details of the medieval city. Some of the top attractions in the city are the 16th-century Lynch's Castle (free admission) and the Galway City Museum, with complimentary views of the bay. The Mankoffs could easily combine a stay in Galway city with a short visit to the Aran Islands, recommended in Traveler's "Destinations Rated: Islands" edition with the following description: "That this feeling, this authenticity, has survived the modern world is nothing short of miraculous." A 40-minute ferry ride (15 to 25 euros round-trip, with cheaper family rates available) from Galway city transports you to the most untouched nature and culture Ireland has to offer. Listen to Gaelic-speaking natives, many dressed in homespun traditional attire. This is no Williamsburg or Epcot. This is honest to goodness frozen-in-time Irish culture at its best. Prehistoric forts, some 2,000 years old, jut out of the jagged Atlantic coast. They are just part of what attracts visitors to these islands, undeterred by modernity, save for a few windmills that allow the islands to be almost entirely carbon neutral. Do you have your own travel dilemma? For the chance to unleash our research staff on your question, email us here. Anything we missed? Share your tips in the comments below. 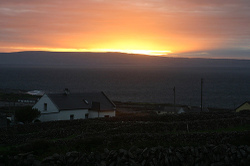 Photos: Above, the Cliffs of Moher, by horsenbuggy; below, Sunrise on Inis Meain, one of the Aran Islands, by RT Felton. Both via the Intelligent Travel Flickr pool. There are a huge bank of these from NGO's at the bankofworks links page. I met a boat builder in Dublin who gave me a job fixing fridges, his son was in my rugby group on facebook. Thanks.